There are limited quantities available of these petals, and discounts/coupons specific to silk rose petals do not apply to purchases from this page as these are already discounted. The petals listed in this section are priced per bag of 200 petals. Some may have minor imperfections, but they are fully separated and ready to use. NEW CHECKOUT SYSTEM: Items ordered from this page use a separate checkout system from the other items on the PetalGarden.com website, but you can get FREE STANDARD SHIPPING on orders of $10 or more using code SPEC918 on checkout (items on this page only). 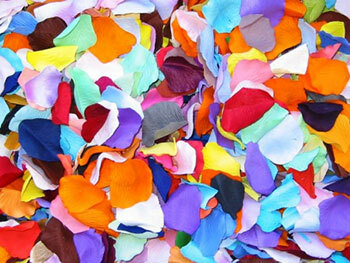 The silk rose petals below are discounted, craft quality petals. Some petals are imperfects, such as frayed edges, folds, uneven color, or other imperfections. Others are from returns where the packaging was damaged or opened. Limited quantities available. Didn't find what you need? You can check out our Coupon page for any discounts on regular products.